nzoCALIFA -- A Fantastic jump off for our Season's programming as Nzo Califa Dance Works produced its first event of the year, "Samba Sendoff Workshop" with one of the Bay Area's most dynamic emissaries of Samba traditions, Ms. Shaunte M. Jackson aka Shaunte MJ, Princesa do Samba USA, the first American to achieve this coveted title in 2015 and 2016. 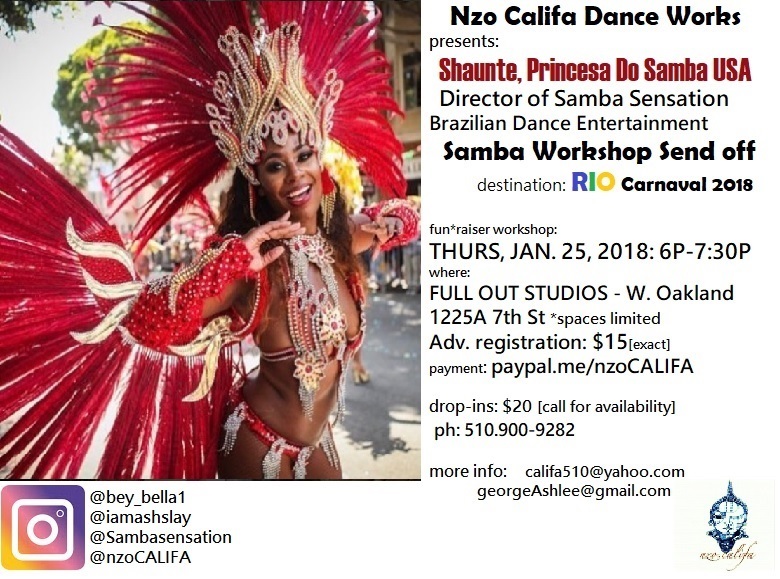 Advancing her career achieving esteemed membership as "Musa das Passistas" (Muse of Samba Dancers) with Rio's Escola de Samba, GRES Academincos de Santa Cruz, guided by the incomparable Marcel Chocolatt, Shaunte continues to trail blaze pathways for aspiring Bay Area Sambistas. As if that weren't exciting enough, Shaunte is an RN accompanied by several certifiable letters in her field, working closely with Heart patients in life and death circumstances. 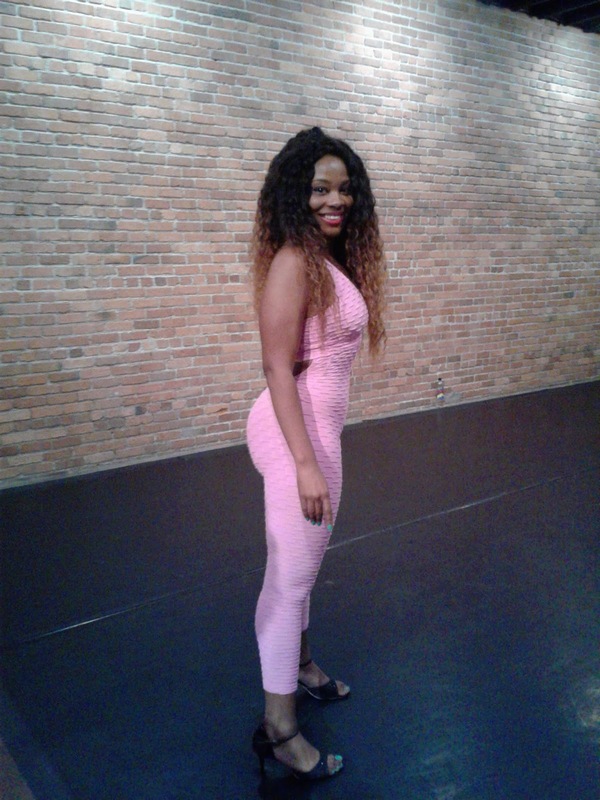 Dedicated, she balances her life doing what she loves -- to Dance and teach traditional and popular cultural traditions of Samba. 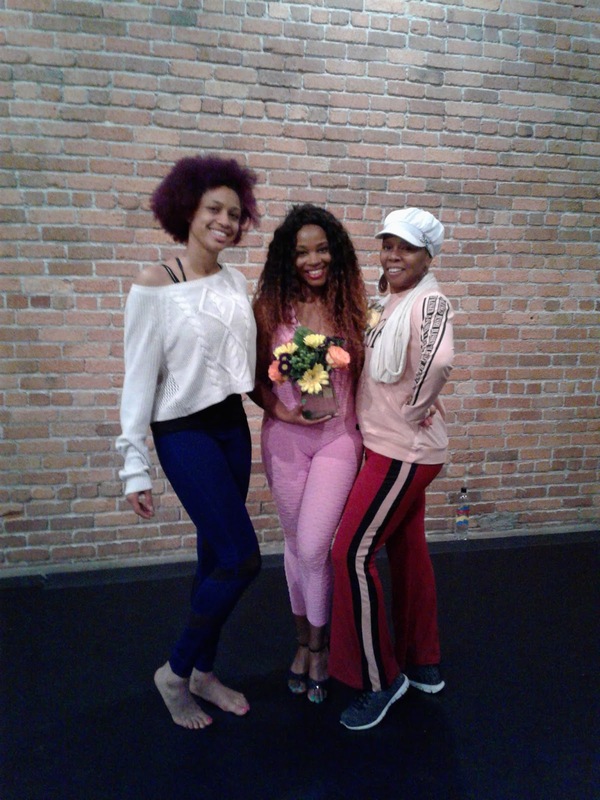 Founder and Director of Samba Sensation Brazilian Dance Entertainment, Shaunte preps for her departure to participate in one the greatest showcase on Earth, Rio de Janeiro's Carnaval of Brazil. In a partnering mission with Dance-kin Ashlee George, Carnaval San Francisco Queen 2012, we booked Shaunte overnight at West Oakland's Full Out Studio -serving as our host Dance house dynamic in energy. *thank you to owner, Anthony Esposo for answering our call swiftly and Ceasar for your wonderful hospitality. "to inspire consciousness in movement." Muita Obrigada to Shaunte MJ for including us in her count down to Brazil voyage, com muito exito; a special Bom viaje to students of @nzoCALIFA in their respective sojourn to Brasil, and shout out to Full Out Studios, until we create Dance-building again. and Choreography work with Companies. So you want to travel or Dance in RIO Carnaval?! Contact Shaunte and engage in organic exchange about making your venture possible. Exciting news from the #nzoCALIFAncestry hub as we've repaired over 27 Community Family Trees, unearthing fantastic stories about our Ancestors. We've met in living rooms, coffee houses and the Library, engaging in the most compelling sessions bringing light to the unspoken and flipping scripts adding technological research. Today, I celebrate, grieve and Dance your Spirit into sweet ascension, adjoined by the many excellent Artists and brilliant Teachers birthed from your Ile, and for that I am pleased to be of kinship, humbled by your final bow of departure. In shared kinship and adoration, I share my deepest sentiments of saudade, celebrating the greatness of Our Mestre King, so eloquently written by my Dance Sistar Linda Yudin, a written keepsake highlighting his vast contributions; and extend heartfelt condolences to our irmao & Mestre Luis Badaro. ~Axe'o Viver Brasil Dance Co.
nzoCALIFA -- WATA, Wezolo Mami, WATER, nature's gold WATERS, my Maternal Family name...I flowed into the New Year prayed up, praised up and in the cove, as incubating works ready for its creative birth awaits sacred passage to gush forward like a waterfall; Mami ebbs, Yeye flows, opening up the way allowing me to "Wade in the Water". New Year's resolutions? You still gotta have a plan, it's the HOW you're going to do what you are divinely commissioned to do? You got goals? What are the daily tasks leading up to those proposed dates? Are you creating a timeline and how will you hold yourself accountable? -- Who do you fellowship with or will you congregate?! Got viable answers, WONDERFUL, walk well, and if not -- STOP, get QUIET and LISTEN! 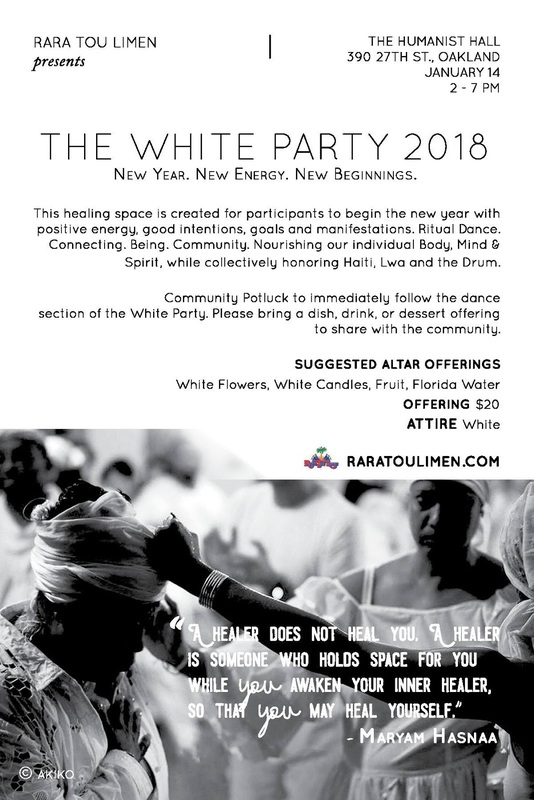 "The Spirituals represent the multi-level genius of our enslaved African Ancestors"
of the watery realm where "Kalunga"
His sermon reminded me of one remarked year whereby invite, I joined an intimate gathering led by Mestre Jorge Alabe, ritual Drummer of the Atabaque and Candomble Priest of Xango to make offerings to Yemonja, the all-encompassing Mother, nurturer, and protector. 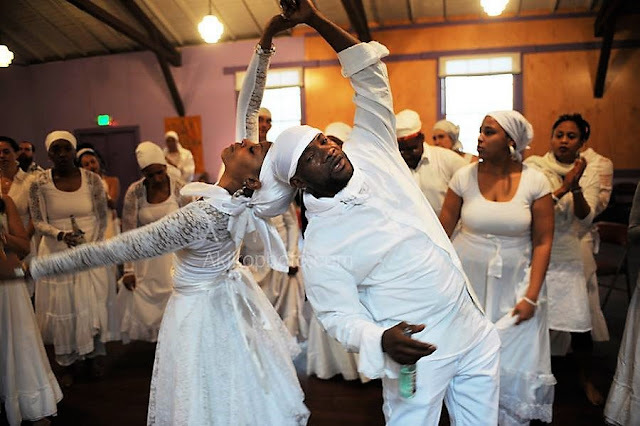 In our Bay Area Community, African Diaspora Dance and Drum Mediums and Students are privy to ceremonial rites conducted by initiated Artist leaders of their respective Spiritual traditions or Cultural form. 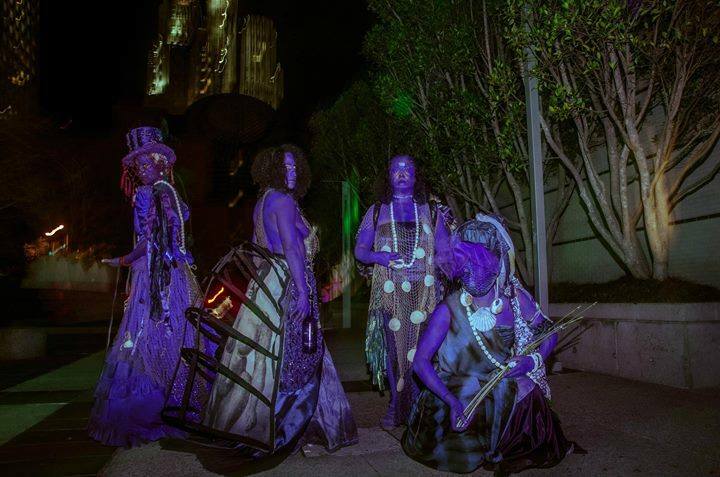 Others learn from Folklorists and Culture keepers who've received Elder clearance as promising stewards mentor with Cultural gatekeepers and Wisdom keepers; the Bay Area Artscape is well-primed to transcend changing social and civil dynamics challenging societal wellness and place. Historically our Community is founded upon pioneering legacies of Spiritual Activism, Civil Rights movements, Community building initiatives, along with the advancing field research works founding some of today's Ethnic Studies programs; these pedagogical methods influenced by Artistic visionaries, continue to influence Dance training in University and College settings. There exists a historical Artistic cadre of 4-generation Arts organizations anchored in buildings throughout the City or in places of residence, still standing as light towers - Our "Walking History". I am reared in a time where my Dance, Drum, and Culture was plentiful and present, named and claimed, with no explanations needed; And as swift currents call for today's realizations, lest we ever forget those names that make US possible to do what WE LOVE, by way of African Ancestored Spiritual and Cultural Traditions. Water as conductor and conduit can bring messages to the surface of a sparkling river or simply through gazing into a sun-kissed glass bowl of water -- these are the ways of my Ancestors. 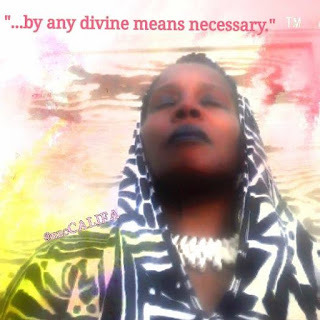 With proficient prayers and libations of my Ancients, name-by-name-by-nation-and-dimension: calibrating, cleansing and cleaning with guided intent, continuing to hydrate my temple and fellowship in Temple, I remain fortified. ~Aboru, Aboye, Abosise'o. Your Spiritual hygiene is as important as your physical hygiene. North Dakota/photo: Birk Albert/Facebook" ~prayers & politiks: "Sign of the Times"
Seize the moment to BE in this Season of Renewal! Already ensoiled with the ocean washed sands of MAAFA Ancestral remembrance, Bay Area Houses Studios and Temples open their doors for the aligned to propitiate the Season. 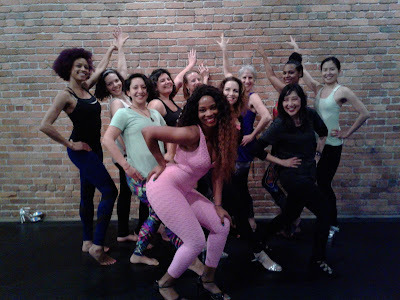 House/Full of Black Women's Ocean visits brings back messages from the middle, Annual Bay Area Lavagems like Brasarte's in Berkeley to 1st of the year classes in White led by Maestra Isaura Oliveira brings the Brasilian Axe experience. At the helm, Bay Area Dance Pioneer and Master Teacher of Haitian Dance traditions, Ms. Blanche Brown give us the best of both worlds as old-school technique reigns supreme with timely grace and form; this legacy continues to carve out new pathways uplifting the Vodou thru White Party Communal rites presented by Rara Tou Limen. 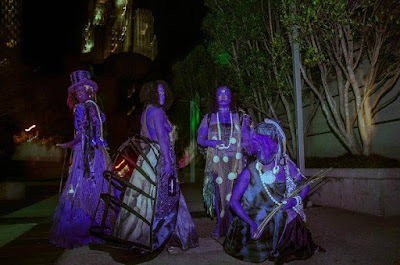 And with guided heads, together: We remember, We propitiate, We're cleansed, We're refreshed and We Dance, Drum and Honor Spirit, invoking the roar of sacred drums with Ancestral applause. 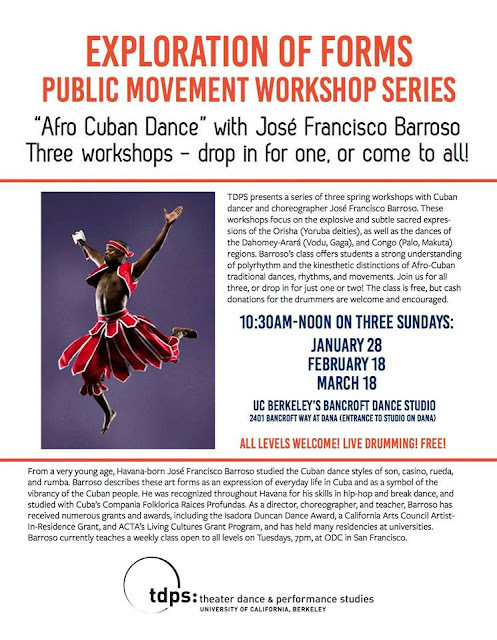 Dance Virtuoso, Master Teacher of Afro Cuban Dance and Drum Traditions, a legacy of Havana's pioneering Folklorico Raices Profundas; Award-winning choreographer and Director of Obakoso Dance & Drum Ensemble. Experience Dance excellence and cultural proficiency with Baba Jose Francisco Barroso. jan 2018 - #AncestorCALL - One of our preeminent Cultural Gatekeepers, Master Teachers and Djembefola of his time Gran Abdoulaye Diakite of Tambacounda, West Africa, Bamana, has transitioned. 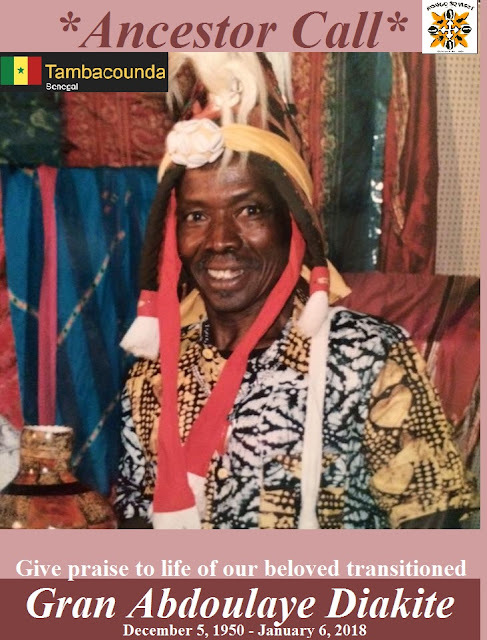 We take a moment to grieve our beloved transitioned extending our deepest sentiments of great loss shared by Gran's Family, Friends Colleagues, the Bay Area-at-large, the many West African Dance and Drum Cultural Communities abroad, as well as Gran's Global Student membership. As were informed by his devoted student and kinship, Jesse Servin, he departed quietly in his sleep ascending into the Ancestral realm. Please remain on standby as Family and emissaries take time to allow this news of monumental proportions to carry forward; Proper arrangements, rites, and rituals are now underway. Your kind thoughts, mindful sentiments, and support forward are humbly received. 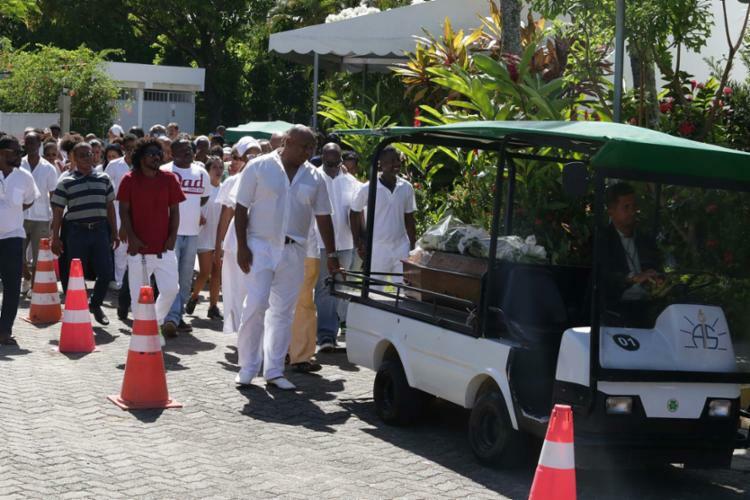 nzoCALIFA -- January 5, 2018, the earth shifted once again beneath Haiti, alarming the world's Spiritual pulse as we learned of the untimely death of prolific Lecturer, Professor and Activist Manbo Rachel Dominique Beauvoir of Le Peristyle Mariani, Haiti, daughter of powerful Spiritual Leader and Pioneer, Ati Max Beauvoir departed just three years earlier; both of whom I was privy to sit before "at the table" in fellowship with my kinship, Rara Tou Limen, in 2014. 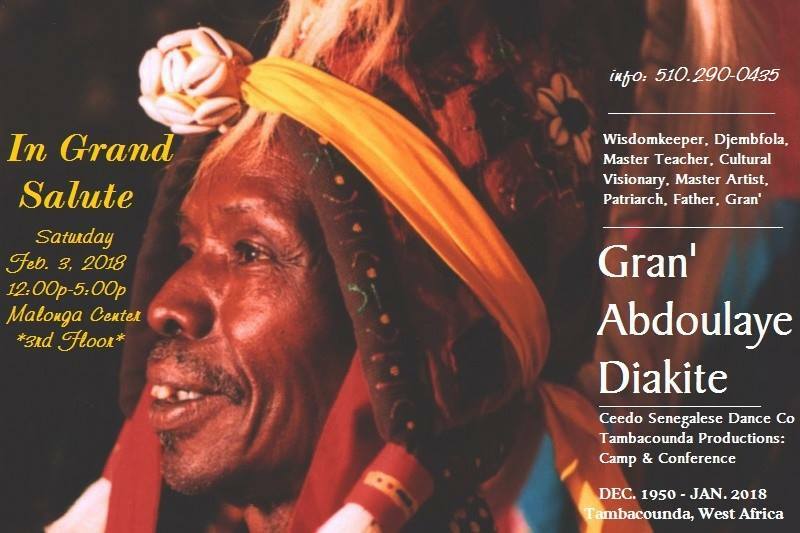 In an unforgettable session, Manbo impressed me as a Liberation leader providing depths of wisdom and tangible knowledge of Haitian Vodou traditions, elevating the vital nature of the LWA, Guede, Secret Societies and the indigenous traditions laced in some of the rituals, invoking an omnipresent Spirit of CHANGE, challenging our service to these traditions. 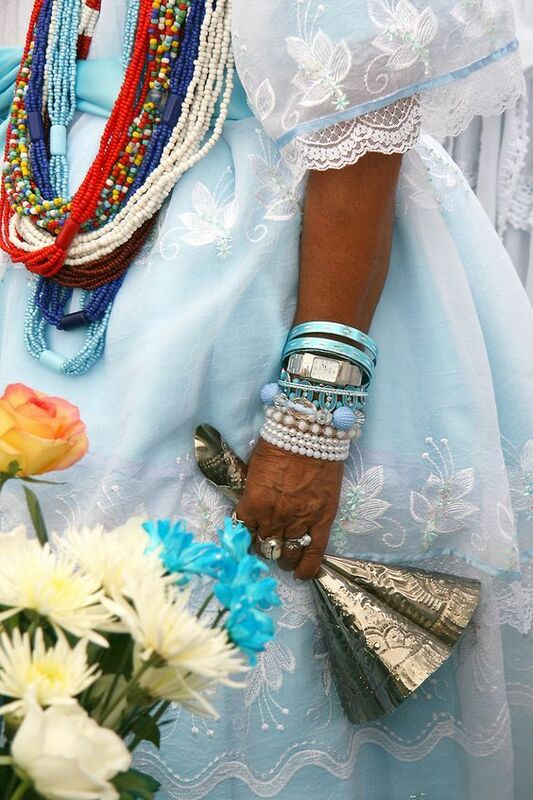 Under the yoke of Spiritual persecution, this is a major passing of the guard that I can only imagine to this day, how this affects global Haitian Vodou Communities, including right here in our own Bay Area backyard. God Bless those of us living who hold these keys, continuing to BREAK THE CALABASH! 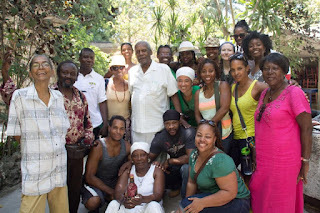 my first sojourn to Haiti on tour with Rara Tou Limen. Manbo Rachel, far left & Ati Max, direct center in white. My #Dancestory2014 Sojourn catapulted me into an adjoined kinship with Rara Tou Limen upon their 10th Anniversary Celebration Cultural Tour and historic performance concert -- in Ayiti! Good works forward assuredly bring great rewards. In Haiti I gained a lifetime of monumental pearls of wisdom, ritual lessons, and unforgettable moments imbuing all of my senses and recommitment to these works. Even on the first day, I encountered by complete surprise my #Kongo kinship Masengo Mbongolo, of Malaki Ma Kongo, Bro. 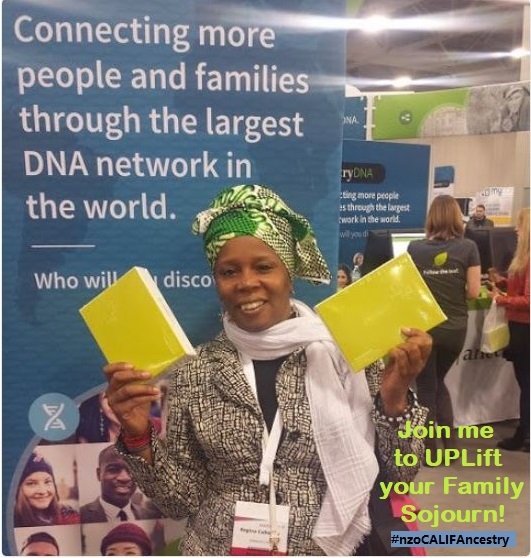 Samba El, CECILE-Malaki ma Kongo-Haiti and Mama Alphoncine Nyélenga Bouya, World Food Program Ambassador for Brazzaville, now residing in Haiti. Near the poteau mitan, we converged at one of the city's historic Le Peristyle Mariani founded by the legendary Ati, Max Beauvoir shouldered by the incomparable stewardship of his daughter Dr. Rachel Beauvoir-Dominique, Mambo. Along the way, prompt many questions of lineage, with increased curiosity to learn stories as to how these traditions were maintained. Some of the most interesting Family histories came from "breaking bread" testimonies of Rara Tou Limen members themselves, some holding direct Haitian lineage with historical allegories primed for the unearthing.Our visit to Musée du Panthéon National Haïtien (MUPANAH) revealed the depth of history preserved from fascinating to harrowing, as it was also a mausoleum for holding the remains of the nation's Freedom fighters and Founding Fathers; some instances displayed the incorrigible drippings of greed exhibiting collections of objects bearing immeasurable wealth, by King's and Queen's of the land. I shall return - and more to wRITE. Grand Spirits who remain ever-present with indomitable force, living thru our works and in Me. The powerful trailblazing legacy of the Beauvoir Family and Le Peristyle Mariani of Haitian Vodou traditions, transforming global perspectives through scholarly works, Institution building and Activism serving the Vodoun, Haitian LWA and its vast pantheons descendants of African Spiritual traditions and indigenous people of Quisqueya.